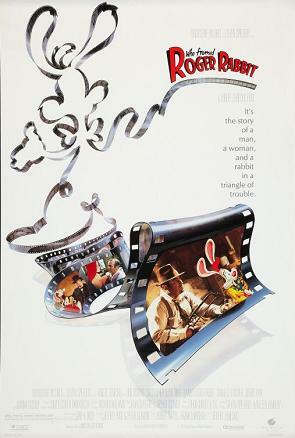 Tag line: "It's the story of a man, a woman, and a rabbit in a triangle of trouble"
The temptation to heap superlatives on Robert Zemeckis’ 1988 comedy / fantasy Who Framed Roger Rabbit is certainly great, and to be honest, I have no intention of fighting the urge to do so. A clever blend of animation and live action, it’s a movie that deserves every bit of praise thrown its way. The year is 1947. The setting: Hollywood, a town that cartoon characters and humans alike call home. Private eye Eddie Valiant (Bob Hoskins) is hired by Maroon Studios to spy on the wife of its biggest “Toon” star, Roger Rabbit (voiced by Charles Fleischer). Sure enough, Valiant discovers that Roger’s significant other, a curvaceous lounge singer named Jessica (voiced by Kathleen Turner), is romantically involved with Marvin Acme (Stubby Kaye), owner of Toontown, a section of the city devoted entirely to Toons. The next day, Marvin Acme is found dead, and all the evidence suggests that he was bumped off by Roger. Claiming he’s innocent, the distraught rabbit turns to Eddie Valiant for help, and though he’s not a big fan of Toons in general, the grizzled investigator agrees to hide the worried rabbit from the police. After taking Roger to stay with Dolores (Joanna Cassidy), who works at a nearby bar, Valiant starts digging into the case, and discovers that, soon after he was murdered, Marvin Acme’s last will and testament disappeared into thin air. Can Valiant piece together the clues in time to solve this baffling mystery, or will Roger be turned over to Judge Doom (Christopher Lloyd), the law in Toontown, who has a knack for disposing of lawless Toons (he “rubs them out” with a turpentine-based solution he calls “dip”)? With Who Framed Roger Rabbit, Zemeckis and company have done more than simply unite cartoon characters and flesh-and-bone actors and actresses on-screen; they’ve created an alternate universe that, in many ways, is more appealing than the real one. I mean, who wouldn’t want to live in a world where you might see Daffy Duck walking down the street, or Pinocchio trying to hail a cab? This peculiar reality is set up in the film’s opening scene, where Roger, a bit rattled by his troubled marriage, screws up what, to that point, had been a flawless cartoon (the moment that his co-star, Baby Herman, voiced by Lou Hirsch, breaks character still cracks me up to this day). Once this bizarre reality has been established, Who Framed Roger Rabbit explores it to its fullest. When Valiant first meets with studio chief R.K. Maroon (Alan Tilvern) to discuss the particulars of the case, he’s startled by Dumbo, who’s hovering just outside the window (“He’s on loan from Disney”, says Maroon, “along with half the cast of Fantasia”). From there, Valiant pays a visit to a private speakeasy, where Donald and Daffy Duck, each playing a different piano, are bickering on-stage. Also present is a black-and-white Betty Boop (Mae Questel), lamenting the fact that, since color toons are now all the rage, the only job she can get is that of a cigarette girl. With cameos by the likes of Woody Woodpecker, Yosemite Sam, Droopy, and, of course, Bugs Bunny and Mickey Mouse; not to mention original toons like the frantic Roger, the sultry Jessica (“I’m not bad”, she tells Valiant, “I’m just drawn that way”), and the ever-helpful Benny the Cab (also voiced by Fleischer), Who Framed Roger Rabbit is an animator’s paradise. I don’t mean to ignore the film's other fine aspects; Bob Hoskins was perfectly cast as Eddie Valiant, giving the character a hard edge that, along with his tragic backstory, serves the film well (during an earlier case, Valiant’s brother / partner was killed when a Toon dropped a piano on his head). Also strong is Christopher Lloyd as chief baddie Judge Doom, who’s hiding a secret of his own. And while its story is played mostly for laughs, there are hints of a bone-fide film noir mixed in as well, which prevents the movie from drifting too far into “kiddie” territory. Yet as good as these elements are, it’s the “Toons” and this fascinating world that makes the movie what it is. Who Framed Roger Rabbit wasn’t the first motion picture to combine live action and animation. In what is undoubtedly the most famous scene from 1945’s Anchors Aweigh, Gene Kelly dances with Jerry the Mouse, from Tom and Jerry; and a handful of Disney movies (Song of the South, Mary Poppins, Pete’s Dragon) have featured actors who walk, talk, and sing alongside cartoon characters. But when it comes to sheer creativity, Who Framed Roger Rabbit is in a class by itself, and, given the chance, it will continue to entertain audiences for generations to come.